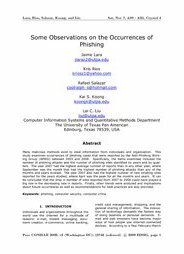 Recommended Citation: Lara, J, K Rios, R Salazar, K S Koong, and L C Liu. Some Observations on the Occurrences of Phishing. In The Proceedings of the Conference on Information Systems Applied Research 2009, v 2 (Washington DC): §3742. ISSN: 0000-0000. Many malicious methods exist to steal information from individuals and organization. This study examines occurrences of phishing cases that were reported by the Anti-Phishing Working Group (APWG) between 2003 and 2008. Specifically, the items examined included the number of phishing attacks and the number of phishing sites identified by years and by quarters. The year 2007 had the highest average number of reports than in any other year, where September was the month that had the highest number of phishing attacks than any of the months and years studied. The year 2007 also had the highest number of new phishing sites reported for the years studied, where April was the peak for all the months and years. It can be concluded that the drop in number of sites reported from 2007 to 2008 could have played a big role in the decreasing rate in reports. Finally, other trends were analyzed and implications about future occurrences as well as recommendations for best practices are also provided.